On the first day of the Spring 2017 semester, national media outlets broke the story. That morning, two legal organizations, the Center for Constitutional Rights and Palestine Legal, sent an eleven-page legal letter to Fordham University’s president contending that the school’s decision to deny official club status to the Jesuit university’s chapter of Students for Justice in Palestine (SJP) violated free speech principles and students’ civil rights. We—that is, Fordham SJP’s founding members, of which I was one—expected to face some Zionist resistance, but the categorical ban blindsided us. After all, several other universities in the tri-state area—Columbia, NYU, John Jay, Brooklyn College, Hunter, Pace, Princeton, Rutgers, and Yale—and many other Jesuit universities—Georgetown, Boston College, Loyola Chicago, and Marquette—have SJP chapters, among the 200 in the US advocating on college campuses for the basic rights of Palestinians. But Fordham did not. In the fall of 2015, we set out to correct that, just over a year after the brutal Israeli assault on Gaza in the summer of 2014 that killed more than 1,500 Palestinian civilians in 51 days. As citizens of an imperialist state that financially, diplomatically, and militarily enables Israel’s war crimes, ethnic cleansing, settler colonialism, and apartheid more than any other, we had a responsibility to stand in solidarity with Palestinians. Doing so on Fordham’s campus, we found, was made close to impossible. Our experience is not unusual. 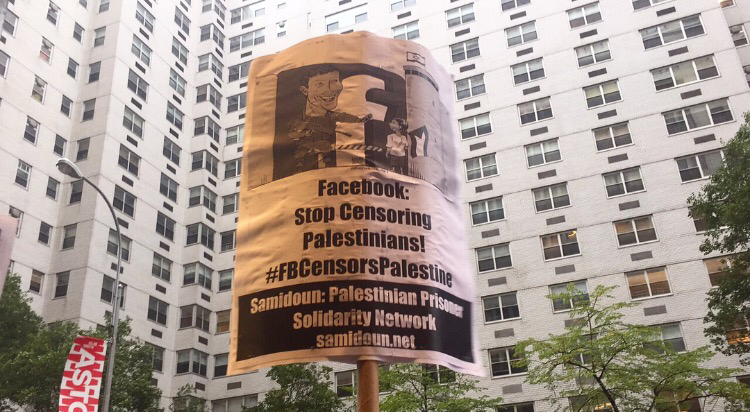 In fact, it is a manifest example of a phenomenon known as the “Palestine exception to free speech,” a disproportionate effort across American institutions to stifle and punish advocacy for Palestinian rights. State governments; officials at museums, community centers, and non-profits; and university administrations in particular regularly capitulate to pressure from pro-Israel lobbyists and suppress the free speech rights of pro-Palestine activists. 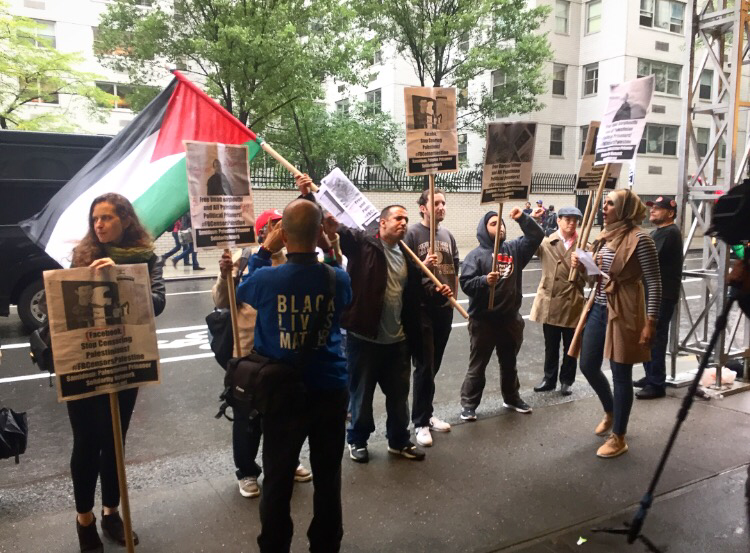 In a 2015 report, our attorneys at the Center for Constitutional Rights and Palestine Legal documented nearly 300 instances of suppression of Palestine activism on more than 65 US college campuses in an 18-month period. Ours was just one. But on December 22, the last day of final exams before winter break, Dean of Students Keith Eldredge emailed us to say that he was exercising his never-before-used veto power to overrule the student government’s vote, denying us club status. First, he wrote, “I cannot support an organization whose sole purpose is advocating political goals of a specific group, and against a specific country, when these goals clearly conflict with and run contrary to the mission and values of the University.” Second, he wrote that our unwavering support for BDS “presents a barrier to open dialogue and mutual learning and understanding” and fosters “polarization rather than dialogue.” Last, Eldredge took issue with our name, saying that its “affiliation” with the national chapter is not the “best way to provide” “open, academic discussion and the promotion of intellectual rigor on campus.” “There is no appeal of my decision,” he wrote in a follow-up. But if Fordham is “committed to research and education that assist in the alleviation of poverty, the promotion of justice, the protection of human rights,” as the mission statement proclaims, then Eldredge’s claim that the political goals of the Palestinian people “clearly conflict with and run contrary to the mission and values of the University” is without merit. Since the Nakba, the forced removal by Zionist paramilitaries of 750,000 Palestinians at the founding of the state of Israel in 1948, the settler colonial government of Israel has increasingly chipped away at the land and rights of Palestinians. Every few years, Israel “mows the lawn” in Gaza, its genocidal euphemism for bombing the besieged population into submission. As occupied people of the West Bank and Gaza, as second-class citizens of Israel, or as refugees across the world denied the right to return, Palestinians should be among the least controversial of groups deemed worthy of international solidarity. We argue that there is little that fosters polarization more than Fordham’s ban on SJP. The most effective barrier to open dialogue and academic freedom is an outright prohibition on a group to advocate its political agenda—precisely what Fordham has done to SJP. The deeply flawed conflation of anti-Zionism with anti-Semitism, one of the sources for the accusation that SJP is “polarizing,” will persist as long as Fordham prohibits SJP from highlighting this distinction. What’s more, every oppressed or marginalized political viewpoint is slandered by the power structure as “polarizing” and “controversial” until it becomes accepted in the mainstream. Powerful officials label something “polarizing” to delegitimize a political idea they don’t agree with. Regarding our so-called “affiliation” with the national chapter (NSJP), we obtained email confirmation, as requested, from NSJP saying that “we have not had any requirements for any group that comes to our conference to include specific language in their respective constitutions.” NSJP’s website makes it clear: “we do not dictate to SJP chapters: all individual SJPs are autonomous student orgs on their respective campuses.” We also added a line to our proposed constitution, again as requested, making clear that “NSJP requires nothing of us, and we have no responsibility to it.” In this context, it’s hard not to view Eldredge’s decision as anything but an attack on an expression of solidarity with other groups fighting for the basic rights of Palestinians and on anti-imperialist politics more broadly. After Dean Eldredge issued his veto, a solidarity petition created by New York City SJP garnered support from more than 125 organizations and 400 individuals. Fordham’s administration received letters expressing support for SJP from more than 125 Fordham faculty members, a group of Catholic clergy and professors, Jewish Voice for Peace, the US Campaign for Palestinian Rights, the Middle East Studies Association, and the Foundation for Individual Rights in Education. When Fordham announced that it planned to stay the course, SJP organized a rally. 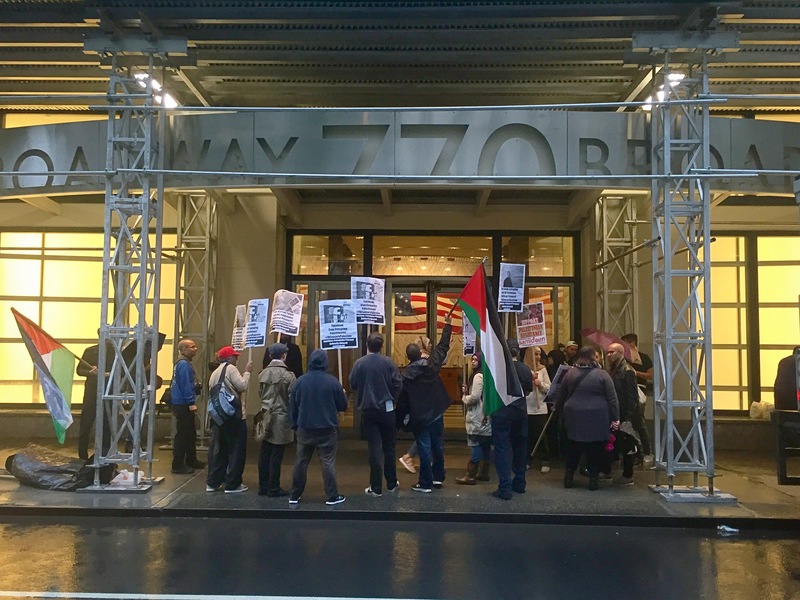 Nearly 50 supporters showed up on a cold Monday afternoon, from students to professors to our comrades in NYC SJP, Jewish Voice for Peace, the Party for Socialism and Liberation, Workers World Party, and the Samidoun Palestinian Prisoner Solidarity Network. Fordham responded by charging a member of SJP with violating the university’s demonstration policy. When Eldredge prohibited her from bringing a lawyer to her disciplinary hearing, she walked out. Eldredge then sanctioned her with a warning. The formal Club Guidelines should have been copied exactly to the Club Registration Packet but for some reason that did not happen… During the making of said registration document, both myself and the members of the Office for Student Involvement assumed that the two documents would be exactly the same, unfortunately that was not the case and we are realizing the error in our assumptions…. I apologize on behalf of [student government] for the confusion… I can guarantee that there was no malicious intent for the differences in the forms, simply a lapse in editing. It’s no coincidence that SJP was the first club to uncover this discrepancy, as no other club has been subjected to the same Trumpian extreme vetting that we were. Fordham tried to explain away the error with the dubious assertion that the confusion created by the incorrectly written documents was a “harmless error created by students, not the university,” and therefore the university wasn’t liable. Ironically, the line in the club application procedure absent from the “incorrectly written” version that magically appeared in the new one—which we did not receive until 11 months after we applied—assigned explicit, unilateral veto power to Dean Eldredge as the final step of the application process. In the old version, Eldredge’s role was merely to “approve” proposed clubs in tandem with another school administrator and before—not after—the student government’s vote. “Fordham’s student speech policies convey at the most basic level that it cannot treat students or groups that promote views that are unpopular or controversial differently or negatively because administrators or others on campus disagree or have negative associations with them,” the lawsuit made clear. If Fordham values “freedom of expression and the open exchange of ideas,” believes that the “expression of controversial ideas and differing views is a vital part of University discourse,” and guarantees that everyone “has a right to freely express his or her positions and to work for their acceptance whether he/she assents to or dissents from existing situations in the University or society,” as its own policies state, then its selective refusal to recognize SJP—in contrast to other political groups like the Feminist Alliance, College Democrats, and College Republicans—based on how much controversy the club’s pro-Palestine, anti-Zionist, anti-racist, anti-imperialist politics could provoke is clearly arbitrary and capricious. Further evidence for the arbitrariness and capriciousness of Fordham’s decision can be found in its concern over the perceived behavior of the “rogue” SJP chapters—NYU SJP’s mock eviction notices, for example. In a statement to media, Fordham said that its officials “aren’t in a position to know the truth of these reports,” admitting that its justification for banning SJP at Fordham was based merely on hearsay about students at other campuses, undercutting any rational basis for its decision. When it came time for Fordham to respond to our lawsuit, it offered an entirely new justification for its decision, one that no university official raised with us at any point in the club application process. Dean Eldredge claimed that he banned SJP to prevent “the resulting possible negative impacts on student safety and the general security of the Fordham community.” As author and activist Sarah Schulman pointed out in her book Conflict Is Not Abuse, Zionists on college campuses have frequently invoked the language of safety and abuse to successfully shut down pro-Palestine activism. Tomorrow, Wednesday, January 3, a Manhattan court could dismiss the lawsuit on the grounds that the university’s decisions are not reviewable by a court. But if the court allows the case to proceed, it will be tasked with deciding whether to grant SJP’s request for a preliminary injunction, an order requiring Fordham to temporarily recognize SJP as an official club while the court considers the merits of the case. Without this injunctive relief, SJP’s members could graduate before they have the chance to make Palestine activism a part of their college experience. Taken at face value, President Trump’s nonsensical declaration of his IDGAF position on a solution to Israeli apartheid –– “I like the one that both parties like. I’m very happy with the one that both parties like. I can live with either one.” –– seemed to signal a slight departure from more than 20 years of U.S. support for the politically acceptable two-state solution. After the 1993 Oslo Accords made the two-state solution popular, Bill Clinton became the first president to endorse it in January 2001. George W. Bush then made it official U.S. policy, where it remained until Trump’s press conference with Israeli Prime Minister Benjamin Netanyahu yesterday. When the New York Times, Washington Post and John Kerry describe what Israel “giving up” being a democracy looks like — “denying full voting rights to Palestinians,” as NYT put it; or, “Most Israelis who favor [one state] imagine an apartheid-like system in which Palestinians would live in areas with local autonomy but without either sovereignty or the same democratic rights as Jews,” in the words of the Post; or, “If there is only one state, you would have millions of Palestinians permanently living in segregated enclaves in the middle of the West Bank, with no real political rights, separate legal, education and transportation systems, vast income disparities, under a permanent military occupation that deprives of them of the most basic freedoms. Separate and unequal is what you would have,” as Kerry put it –– what they’re actually describing is the current reality for Palestinians. If Israel were to “give up” being a democratic state after implementation of a one-state solution, it would look no different than it does now. The conception of a two-state solution, as the Times, Post and Kerry see it, would “cosmetically repackage this injustice as Palestinian ‘independence,’ without fundamentally altering it,” Abunimah wrote. “What [Kerry] offers Palestinians is a demilitarized bantustan with the singular purpose of preserving an all-powerful Israel as a racist state with a permanent Jewish majority.” In other words, a two-state solution would not solve the problem of apartheid. It would also allow the racism inherent to Israel as a Jewish state to persist. Without doing so explicitly, the argument made by the Times, Post and John Kerry acknowledges that Israel, under a one-state solution, would be morally indefensible as a Jewish state. The only realistic solution, therefore, is one state with equal rights for all. It’s worth noting that Trump’s lack of explicit support for a two-state solution in the press conference yesterday does not mean the United States has all of a sudden abandoned support for it. In fact, today Trump’s team has already began to clarify or walk back Trump’s comments during the press conference, affirming U.S. support for a two-state solution. “We absolutely support a two-state solution,” Nikki Haley, U.S. ambassador to the United Nations, said. The two state-solution is the “best possibility for peace in the region,” said David Friedman, Trump’s nominee to be U.S. ambassador to Israel. Whether or not all of these policy pledges will turn into actual policy is to be determined. But what’s significant in the draft order – what the draft order reveals – is Trump’s more-than-rhetorical willingness to resurrect some of the most egregious policies of the Bush administration, only some of which Obama did away with, to his credit. Reposted at The Huffington Post. On Thursday afternoon the Center on National Security at Fordham University School of Law hosted Sen. Chris Murphy (D-CT) for a discussion about U.S. foreign policy. During the Q&A, I asked (broadcasted on Periscope) Murphy – who self-describes as a progressive on foreign policy and whom Buzzfeed called the “Elizabeth Warren of foreign policy” – why he voted in May 2014 to confirm David Barron to the U.S. First Circuit Court of Appeals. Barron, as acting head of the DOJ’s Office of Legal Counsel, wrote the legal memo that justified the extrajudicial drone killing of U.S. citizen Anwar al-Awlaki (and his 16-year-old son Abdulrahman) in Yemen in 2011. Aside from the fact that Barron was not a judge who issued rulings as a judge before Murphy voted to confirm him to do such a thing, since Barron joined the First Circuit the panel has not made any major decisions on issues of national security or the war on terror that he has voted in. [E]xecutive branch actors, particularly those attorneys helping to assure that the President takes care the law is faithfully executed, should not abandon two hundred years of historical practice too hastily. At the very least, they should resist the urge to continue to press the new and troubling claim that the President is entitled to unfettered discretion in the conduct of war. But by 2010, just two years later as a lawyer in the Obama administration, by drafting a legal memo that further legitimated the president’s sweeping powers, Barron had acted in direct contradiction to what he advocated lawyers do in his article. So for the sake of Barron’s credibility in the mind of Sen. Murphy, Barron’s poor actions in 2010 invalidated his noble stance in 2008. It’s a classic case of a government official’s actions not matching their words. What Murphy considers to be Barron’s “other decisions that were a pretty good advertisement” thus remains unclear. In his answer to my question, Sen. Murphy continued, “I also will probably have an unsatisfactory position to you and to some others when it comes to some of the new tools at the president’s disposal to keep this country safe. One problem, [a former drone operator] explains, is that targets are increasingly aware of the NSA’s reliance on geolocating, and have moved to thwart the tactic. Some have as many as 16 different SIM cards associated with their identity within the High Value Target system. Others, unaware that their mobile phone is being targeted, lend their phone, with the SIM card in it, to friends, children, spouses and family members. Was Murphy referring to the government’s dubious Terrorist Screening Database, nearly half of whose 680,000 people are not affiliated with any terrorist group? Or was he referring to the no-fly list, whose length Obama has increased ten-fold since taking office? Murphy’s support for the renewed version of the Patriot Act, known as the USA Freedom Act, doesn’t put him in the progressive camp, either. He had a chance to join fellow senators, led by libertarian Rand Paul, who opposed the act on the grounds that it didn’t go far enough in restricting the NSA. That faction simply wanted Section 215 of the Patriot Act – the section that gives the government broad surveillance power – to sunset as scheduled. To his credit, in September Murphy spearheaded a bill (that failed to pass the Senate) to block a huge U.S. arms deal to Saudi Arabia in light of the Kingdom’s brutal war against Yemen. That’s what a progressive foreign policy position looks like. While Sen. Murphy often lands to the left of the majority of Congress on foreign policy, it’s otherwise clear that if he wants the “progressive on foreign policy” label, he needs to reconsider his positions on several aspects of the war on terror. Disclosure: This writer provides research assistance to the Center on National Security on a weekly basis.